You can walk for days on this gorgeous beach! 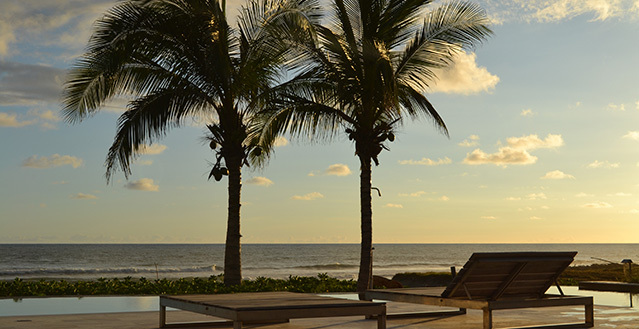 Located in the very private and exclusive gated community of Los Naranjos, you will have the beach all to yourselves. 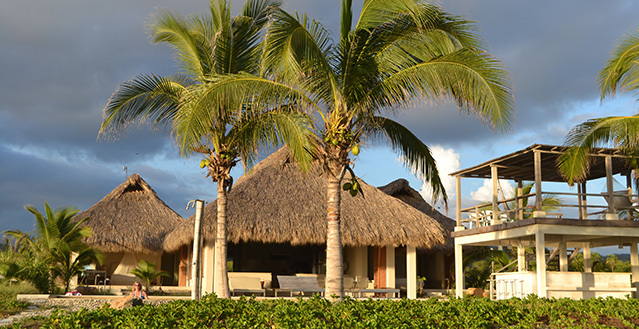 Nothing is as beautiful and romantic as a palapa roof. 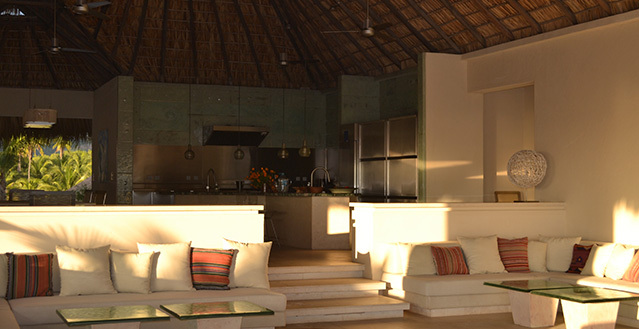 Every room has cathedral palapa roofs. Each bedroom has a king size bed. 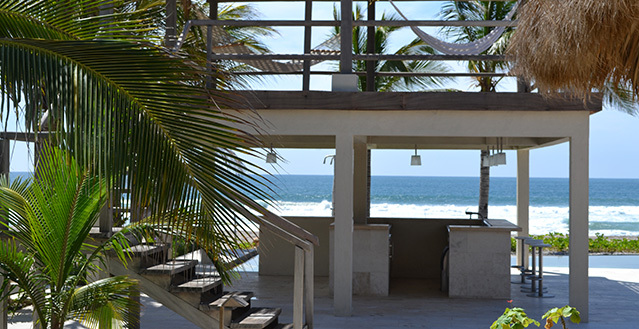 Cedar louvered rollaway doors allow for views of the ocean. The bathrooms are equipped with top quality imported European fixtures. The guesthouse has four bedrooms and two full bathrooms. Each bedroom has two single beds (which can be joined together) and a loft bed. Facing the ocean, the great room has cedar louvered rollaway doors to allow for unobstructed views of the ocean as well as constant fresh ocean breezes. Two large sectional sofas allow for plenty of lounging space. The abundance of stainless steel counter tops, a huge granite island with two sinks, a six burner gas stove, European made appliances, cookware, plates, serving dishes and cutlery, makes for a gourmet's dream kitchen. 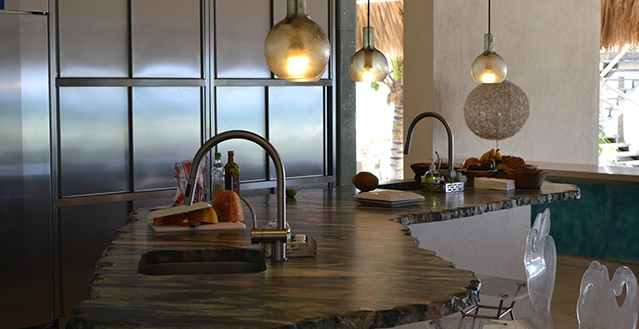 This open concept chef's kitchen allows for unobstructed vistas of the ocean while you cook away with the freshest of ingredients from the market. There's plenty of room for family and friends to join in or to keep you company. An adjacent working kitchen allows for staff to unobtrusively prepare meals. 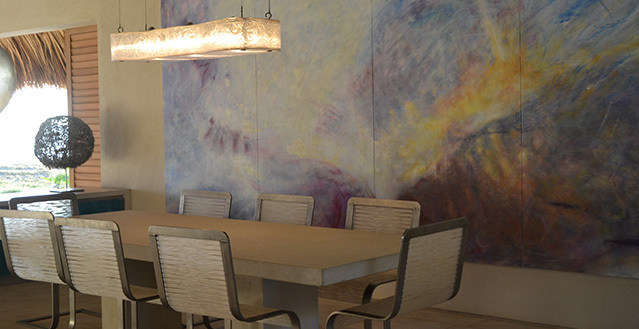 Dining room tables inside the house and near the pool allows for plenty of seating and dining preferences. 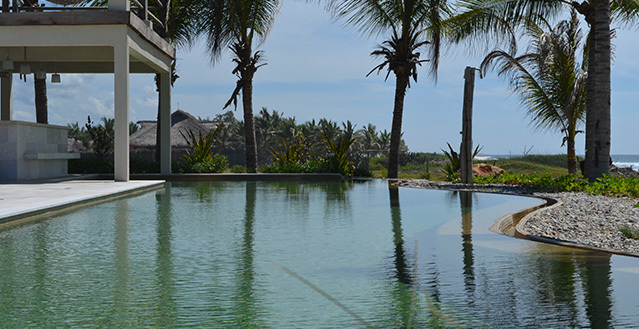 The beautiful multi-use pool has a large shallow area for lounging, is long enough to swim laps and has swim-up bar stools for enjoying your favorite beverage in the pool. 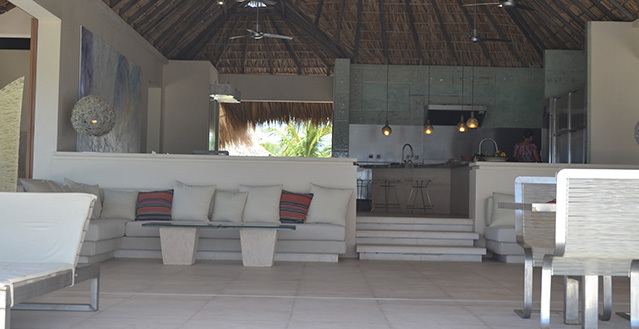 The pool bar is equipped with all the appliances necessary to make the most exotic drinks. This shaded lookout is a fantastic place for lounging in hammocks, watching whales, dolphins, turtles and other ocean wildlife. 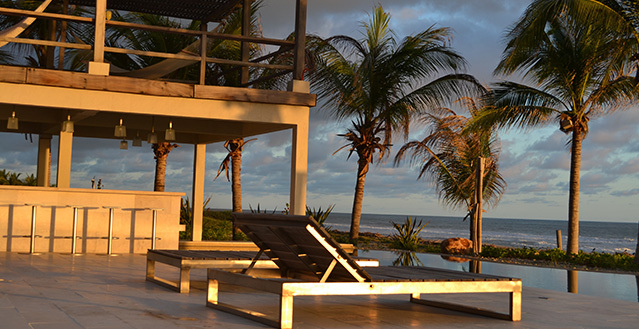 It's a wonderful place for everyone to meet for drinks and to watch sunsets at the end of the day. 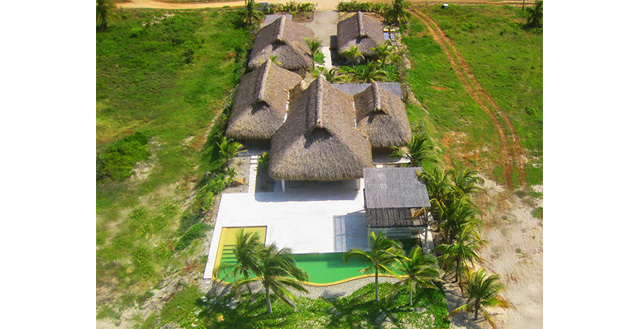 You'll love the bird's eye view you get up here of the ocean and beach. This large and comfortable room with 6 meters of lounge space is perfect for watching movies directly from the internet on your computer or looking at your photos at the end of the day. Staff lives in a separate house on the property. They maintain the property and will take good care of you. A professional cook will prepare for you healthy and mouthwatering meals. 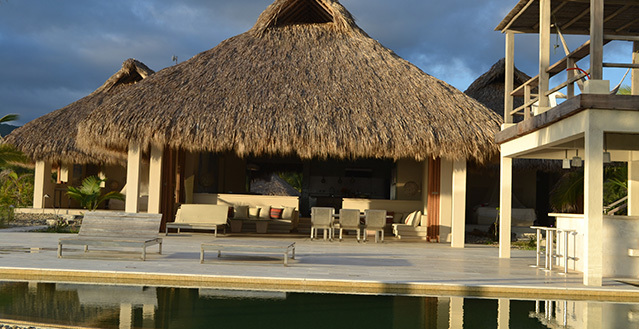 Our property manager can take you on many fun and interesting excursions and arrange for or provide transportation. 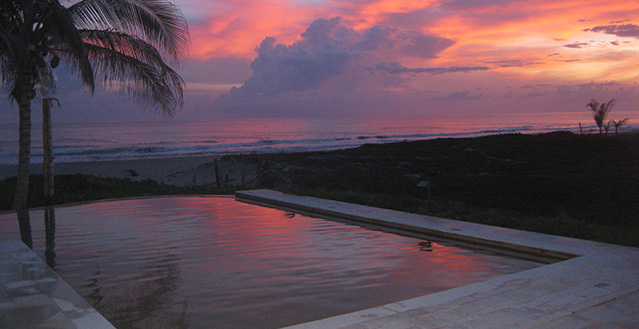 Casa Ola Hola is one of only twelve homes in the prestigious gated community of Los Naranjos. Security is provided 24/7. 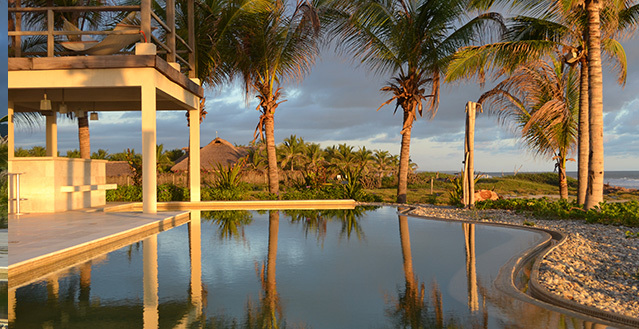 Los Naranjos has a strict building code, so each house is very tastefully designed. 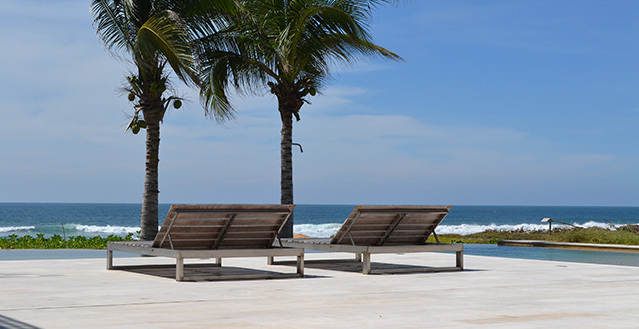 It's a 15 minute drive to the small fishing town of Puerto Escondido. 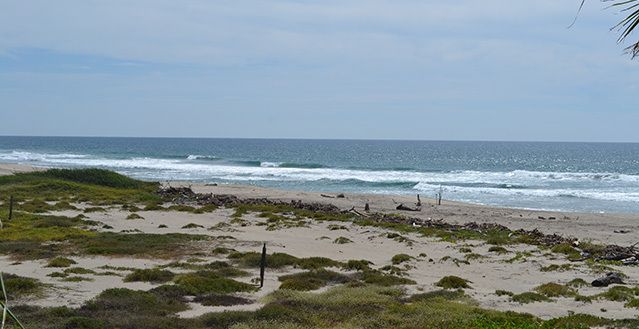 In Spanish Puerto Escondido means hidden port. The name well describes this unique place. 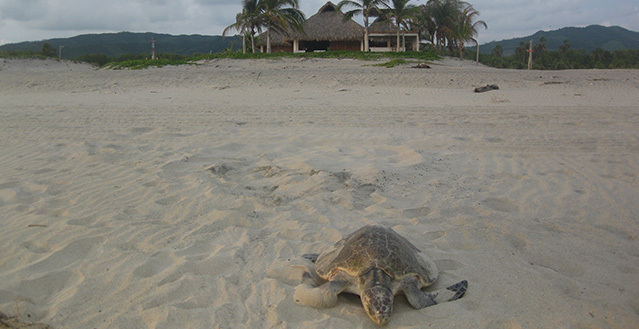 It is located on the Pacific coast in the southern part of Mexico. It is not a destination known for large or all-inclusive hotels, because there aren't any. 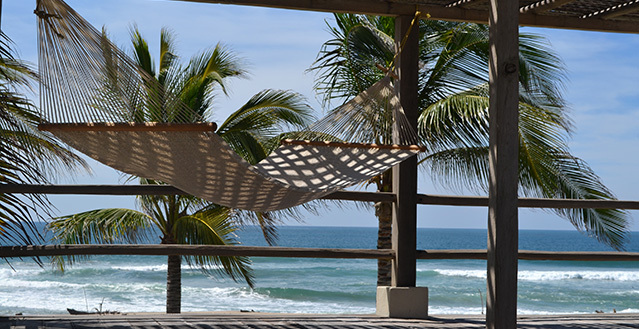 Instead, Puerto Escondido is a fishing town that has incredibly beautiful beaches. It also has a large and popular market. In the market you will find seafood caught that morning. As well, there is always a huge assortment of fruits and vegetables that are locally grown or come from farms up the coast and mountain villages. The coffee comes from nearby mountain plantations and couldn't be more fresh and fragrant. The dry season is from November to April. During these months you will enjoy perfect sunny days. Many surfers come in the summer for the "epic" waves. 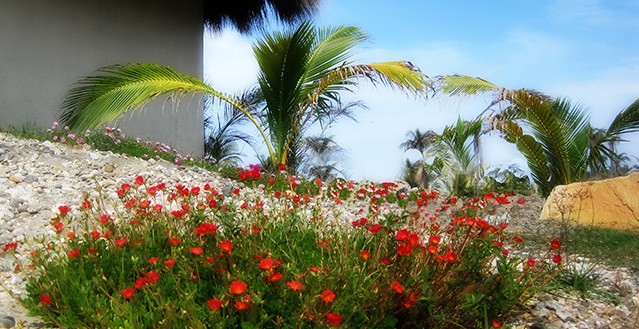 Numerous other visitors come then because of the amazing vegetation that grows that time of the year. The temperature of the ocean is always warm ranging from 26-30°C (79-86°F). Many people come to surf here so it's a great place to take surfing lessons. 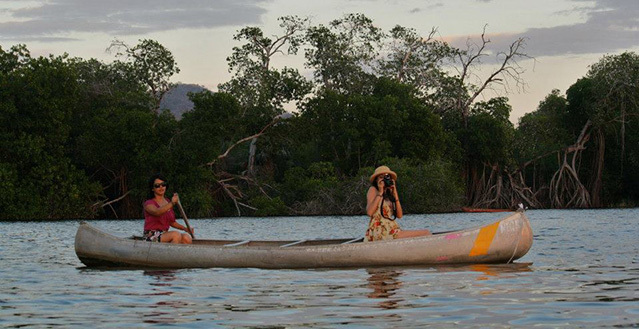 You can also go dolphin and whale watching as well as scuba diving and deep sea fishing. 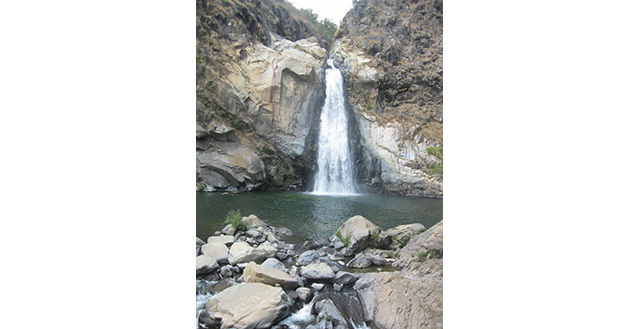 There are beautiful waterfalls and safe roads and paths for biking. 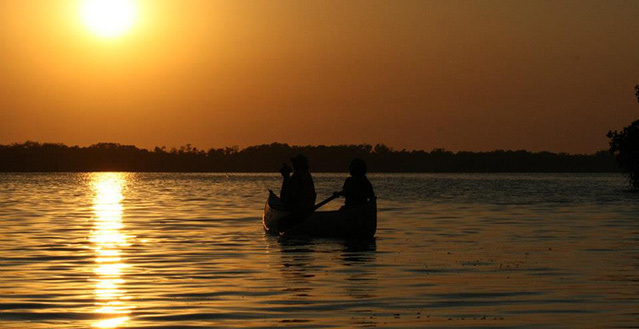 The Laguna de Manialtepec is a bird watcher's paradise. 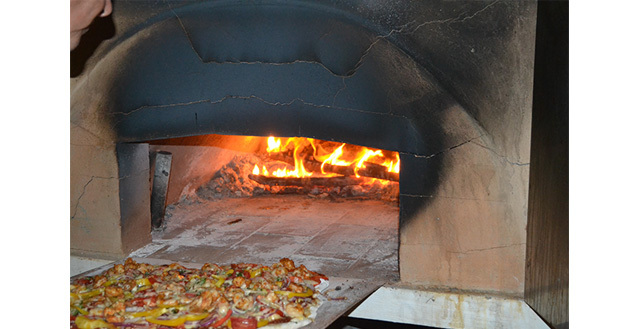 Gourmet restaurants feature freshly caught seafood and fresh ingredients from the local market and there are magical laid back restaurants on the beach. Interesting crafts, jewelry and clothing made by local indigenous peoples are sold in town. 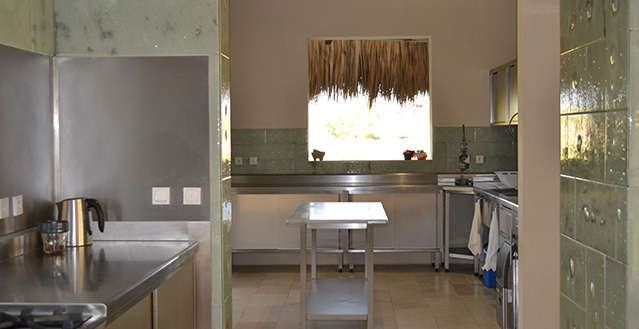 We can organize cooking workshops at Hola Ola with a local chef. You will be taken to the market to learn about local ingredients. Here there are the famous Oaxacan cheeses, locally grown fruits and vegetables, the freshest of seafood, meats and of course, just-made tortillas. Afterwards, with the ingredients acquired in the market, you will return home where you will learn how to prepare flavorful and fragrant Mexican cuisine. 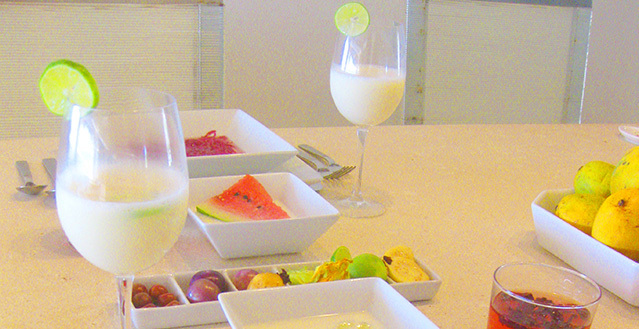 Our property manager is a raw food expert who can show you how to prepare healthy and delicious raw food meals. 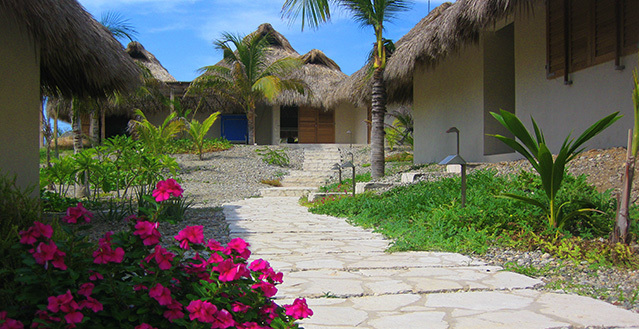 We can provide guided tours and well-planned excursions in and around Puerto Escondido with transportation and everything else you will need.